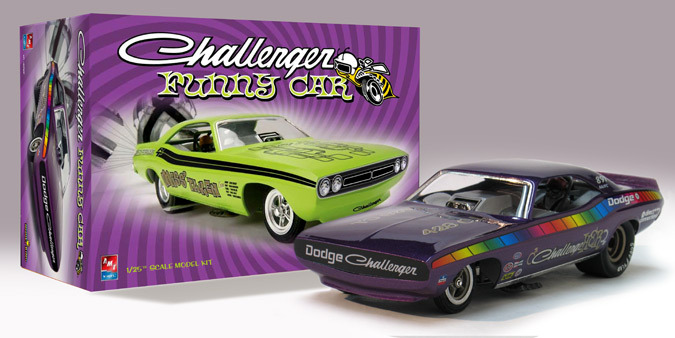 This Challenger Funny Car was another box art project I designed for Model King. It's a re-issue of the old MPC Soapy Sales kit from the early seventies, this time with an all new box and decals. 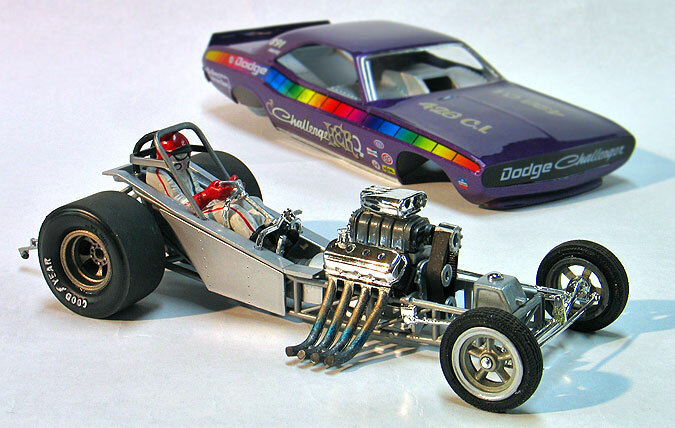 Model King owner Dave Burket liked the concept of having another "box art build-off" so he asked both myself and Tom Miller to each build a model to photograph for the package. 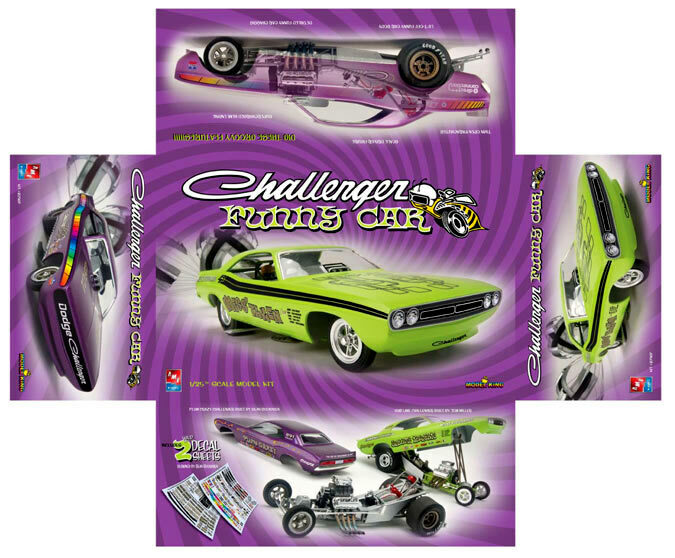 I discussed it with Tom and we decided it would be neat to do them in the factory high impact colors, so I built the Plum Crazy purple car and Tom built the Sublime green car. These models were built right the box, but mine and Tom's differ slightly from each other. 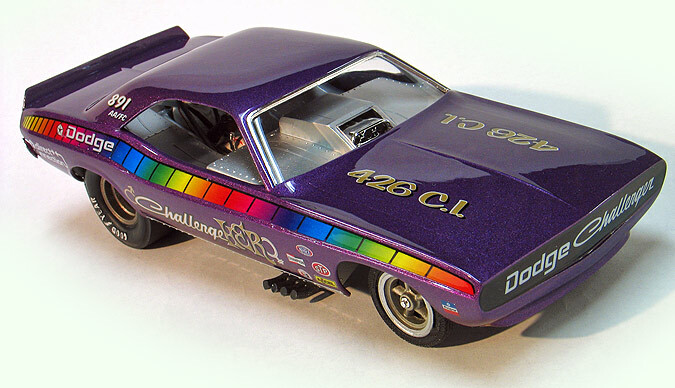 Tom chose to leave the wheels chrome on his car while I painted mine in contrasting aluminum and magnesium colors. Tom also added the optional winglets to his chassis while I left mine off. One of the neat extra features of this kit is the optional driver figure and the twin open parachutes. For the box photography we wanted to showcase the parachutes open so Tom built a set or parachutes and added stiff wire to them to represent the chute lines. He attached the wire to a lead weight which allowed the chutes to hover out in space. He sent it to me and I photographed the cars with the trick chutes suspended in the air behind the cars which gave them the illusion of being open. The paint on mine is Testor's new lacquer based paint shot straight from the spray can. After the decals were applied I used a touch up gun and shot the body with PPG urethane clear. 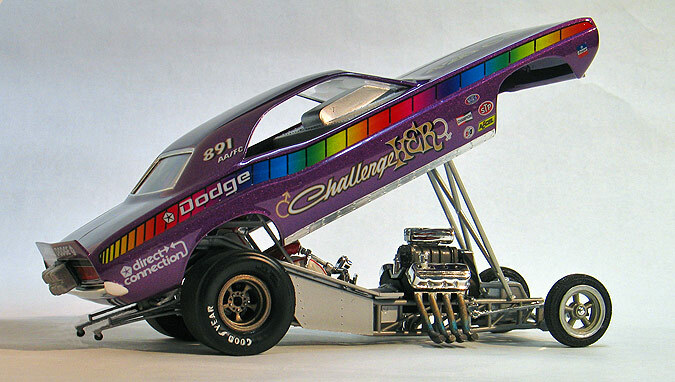 The rest of the chassis was finished in various Testor's metalizer paints. For the package design I wanted to do another psychedelic '70's themed box, so I went to the web for some ideas. I remembered how popular the black light posters were when i was a kids and looked at a few of those for ideas. In those, I found my inspiration for the twisted look featured on the background of this box. 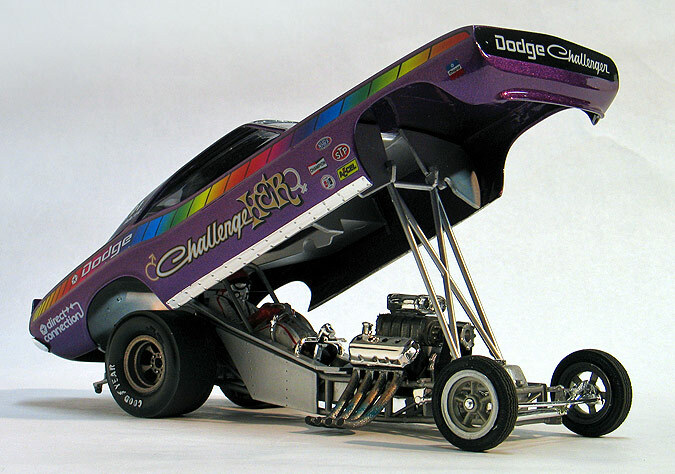 It was a simple idea, but I thought it would have a lot of visual impact without overpowering the cars. I photographed the cars on a white background and blended the photos together in Photoshop. I also had the manufacturer print the inside box with the twisted graphic too in black and white. The manufacturers have traditionally ignored the inside of the box, but I think it adds an extra little something to the kit. I've usually tried to add art there when I could. 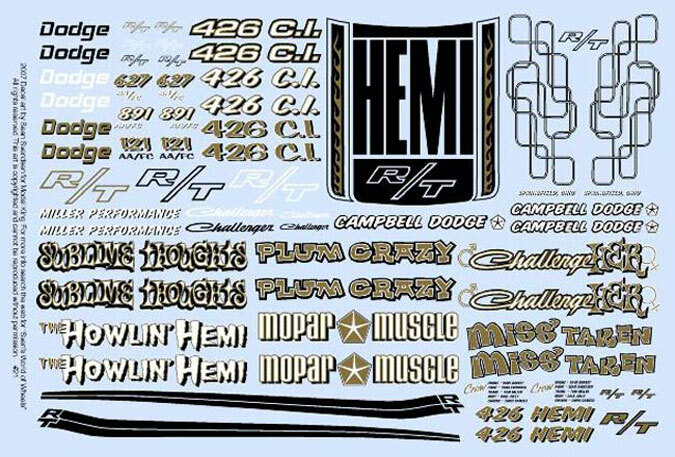 Over the past few years the kit manufacturers have gotten pretty skimpy with their decal sheets. As a builder, I really appreciate having options and getting extras. I always thought to myself, that If I had the opportunity, I would do it differently. 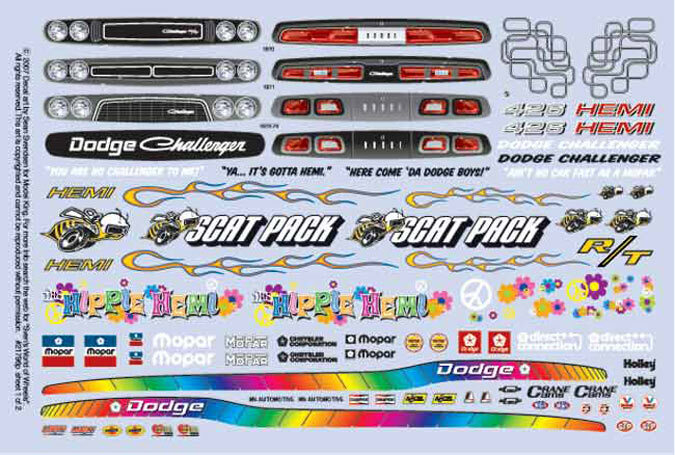 Since we were featuring two cars, we again decided to put two decals sheets in this kit. I made the sheets as big as the box would allow and I was excited by this because that gave me a pretty big blank canvas to do some wild decal art. Because these would be fictional cars, Dave and I brain stormed some ideas for names and I created original logos for them. 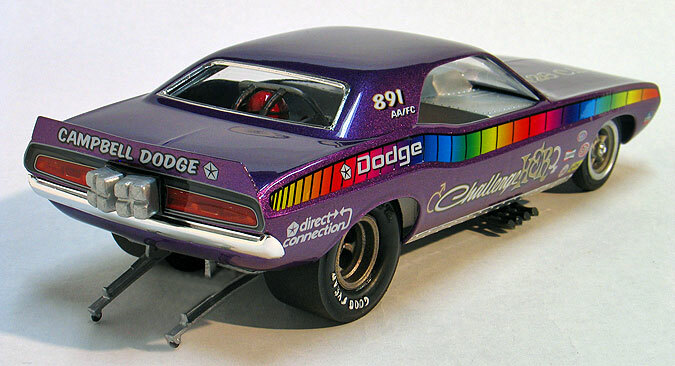 I also created grill and taillight artwork for all the different '70-'74 model years, flames, strobe stripes, stock '71 R/T stripes, sponsor stickers, etc. so builders would have a wide variety of choices. 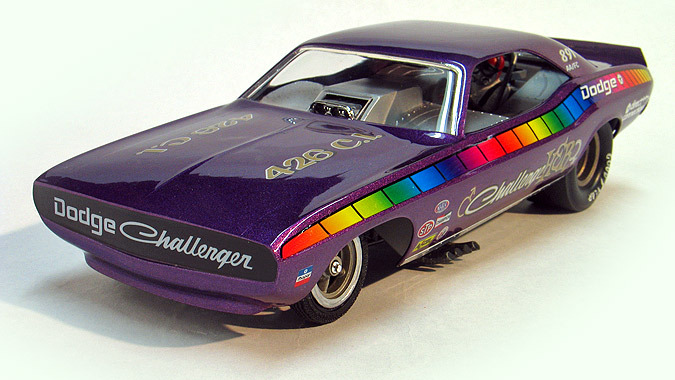 Click here to see other model kit packaging and decals I've designed.